NAPA VALLEY, CA (May 2, 2016) – Race fans will soon be able to get up close and personal as we follow four race teams competing at the 2015 running of the National Auto Sport Association’s 25 Hours of Thunderhill, presented by Hawk Performance. The documentary titled “Survive the 25” chronicles the experience of competing in the longest endurance race in the United States, which is held each December at Thunderhill Raceway Park in Willows, California. Television viewers will get behind the scenes views of all the action and drama that the 25 Hours brings. This one race is the equivalent of an entire race season all rolled into one. 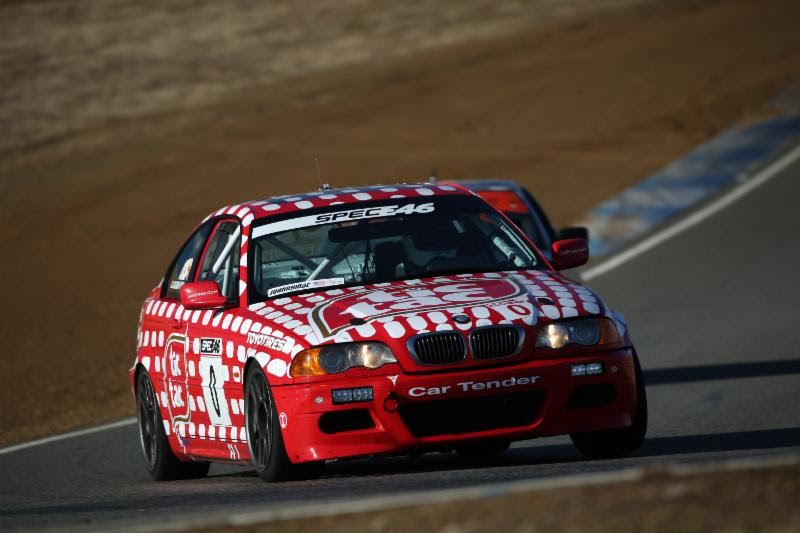 NASA’s 25 Hours of Thunderhill presented by Hawk Performance has become a staple of endurance racing, drawing top competitors and teams from all around the world. The changing weather, deep field of competitors, and taxing track layout make the event especially exciting for teams, drivers and fans alike. “Survive the 25” is a documentary that chronicles the struggles and triumphs of four teams as they battle through the 2015 NASA 25 Hours of Thunderhill presented by Hawk Performance. The show will premier on the MavTV network Tuesday, May 3rd at 6pm ET. The show features 4 teams, CLP Motorsports, Flying Lizard (Team Toyo), Ryno Racing, and the factory Mazda effort. For a quick glimpse of what you can expect to see in this years "Survive the 25", watch the official teaser trailer here. For TV Schedule: Show premiers May 3, 6pm ET. The show re-airs each Tuesday at 6pm ET. for the remainder of the month. NAPA VALLEY, CA (April 25, 2016) Registration for the 11th annual NASA Championships is now open and includes a new registration option many may find appealing! The Championship tour will first visit historic Watkins Glen International Raceway in beautiful upstate New York, site of the 2016 Eastern States Championships presented by Toyo Tires. The event will kick off September 22-25, 2016. This prestigious track will challenge competitors as they vie for their championship title. NASA then heads west to Buttonwillow Raceway Park in central California; Home of the 2016 Western States Championships presented by Toyo Tires. The event is scheduled for October 13-16, 2016 at the locally loved challenging race track that will test the skills of the best NASA competitors in the west as they battle their way toward victory circle. If you’re ready to be a part of these historic events, then we encourage you to head over to www.nasachampionships.com on April 25, 2016 and get yourself registered for the NASA Championships. You will find the registration pages for each event here. NAPA VALLEY, CA (April 23, 2016) NASA is pleased to announce an exciting new Toyo Tires program available this season to the Spec Miata community. This new program will provide early registrants for either NASA Championship event the opportunity to collect up to four free Toyo Proxes RR tires for use at either event. Register early, buy a set of Toyo Tires and get free tires courtesy of Toyo Tires. Complete program details below. “Toyo Tires continues to demonstrate their commitment to the amateur racing community as a whole,” said Jeremy Croiset, NASA Director of Business Development. “This new program delivers a clear message that they are serious about ensuring the NASA Championships remains “the” place to compete for a Spec Miata Championship”. Program Rules: The first 20 competitors that register for each NASA Championship event (opening April 25, 2016 at Noon EST.) and buy a set of Toyo Tires will be eligible for 4 free 205/50ZR15 Proxes RR tires. The next 10 competitors that register for each Championship event and buy a set of Toyo Tires will be eligible for 2 free 205/50ZR15 Proxes RR tires. To be eligible to collect your tire awards at either event, you’ll be required to submit to NASA a proof of purchase on or before Sept 5th, 2016 demonstrating you purchased a set of four Proxes RR tires through an authorized Toyo Tires Motorsports vendor. The proof of purchase must be dated between April 25, 2016 and Sept 5th, 2016. Competitors that comply with these program requirements will have their free tires provided to them at their respective NASA Championship event. You must participate in either Championship event and provide proof of purchase to receive your tires. In the event an early Spec Miata registrant cancels their Championship entry, the reward will be made available to the next Spec Miata registrant in succession. 2016 NASA Eastern and Western States Championships Update! It’s Championship Time! Who is going to be in the Winners Circle? Registration for our 2016 NASA Eastern & Western States Championships Presented by Toyo Tires will open Monday, April 25, 2016 at 9am PST. from nasachampionships.com. Spec Miata Racers should pay particularly close attention in the next 48hrs as an exciting announcement from Toyo Tires is imminent! NAPA VALLEY, CA (April 12, 2016) – Race fans will soon be able to get up close and personal as we follow four race teams competing at the 2015 running of the National Auto Sport Association’s 25 Hours of Thunderhill, presented by Hawk Performance. The documentary titled “Survive the 25” chronicles the experience of competing in the longest endurance race in the United States, which is held each December at Thunderhill Raceway Park in Willows, California. Television viewers will get behind the scenes views of all the action and drama that the 25 Hours brings. This one race is the equivalent of an entire race season all rolled into one. NAPA VALLEY, CA (March 24, 2016) – The National Auto Sport Association (NASA) is pleased to announce the Ford Performance Contingency Program for NASA competitors in 2016. The program will provide fantastic cash awards to NASA racers competing regionally and at both NASA Championships events. The program provides awards to competitors in the American Iron Series, Spec Iron, Super Touring, Performance Touring, and Super Unlimited classes. Spec Iron competitors are eligible for up to $1,000 in cash awards for regional championship top 3 finishes! Additionally, Spec Iron along with the other classes in the American Iron Series, Performance Touring, Super Touring, and Super Unlimited classes are eligible for $2,250 in cash awards for top 3 finishes in their respective regional championships. To sweeten the pot even further, Ford Performance will offer NASA competitors at both Eastern and Western States Championships the chance to collect $4,250 in additional cash awards! The contingency program is available beginning immediately to all NASA competitors in these respective classes at each NASA regional and Championship event. For complete information on the contingency program, please visit http://www.nasaproracing.com/contingencies. NAPA VALLEY, CA (March 22, 2016) – The National Auto Sport Association (NASA) is pleased to announce that Millers Oils was recently named the Official Lubricant of NASA for the 2016 season. Millers Oils is a leading producer of high performance motor oils and fuel additives, with global distribution. Sourcing the very best raw materials for their formulations, Millers Oils is focused on delivering their customers with more horsepower and less wear through their unique approach to lubricant solutions. Established in 1887, Millers Oils is one of the longest standing producers of lubricants in the world with a history rich in firsts. “It’s an honor to welcome Millers Oils to the NASA family,” said Jeremy Croiset, NASA’s Director of Business Development. “Millers Oils is rich with history and is one of the best kept secrets in the world of motorsports. Their expertise and high quality products should be well received by fellow NASA members”. Beginning immediately, Millers Oils will provide NASA members a special members benefit of 30% off all Millers Oil Motorsports products as well as Millers EE line of Road Oils. To take advantage of these awards, please visit https://www.nasaproracing.com/benefits. Additionally, Millers Oils plans to make available a lucrative contingency program later this season for NASA competitors. Details on the Millers Oils contingency program will be available soon. To learn more about the benefits you can expect from Millers Oils and find out what you might be leaving on the table, head over to http://www.performanceracingoils.com or https://www.youtube.com/watch?v=VggD0_aHkmI. Millers Oils is a leading independent blender of oil and fuel additives based in Brighouse, West Yorkshire, UK. Started in 1887, they are one of the longest standing lubricant companies in the world. Focused on delivering high quality innovative new products and excellent service through a smaller independent structure. This independence allows for the sourcing of the best raw materials and the formulation of the best lubricants in the business. A winner of numerous awards, Millers Oils is dedicated the art of making more horsepower while also increasing life in your automobile. Napa Valley, CA (February 23, 2016) – NASA is pleased to announce that the AST Suspension contingency program has been renewed for 2016 . While otherwise similar to last year's arrangement, Time Trial drivers can now claim AST contingency for regional events as well. NASA Eastern and Western States Championships participants will have the opportunity to win a generous $1,000 credit in any of the 31 eligible classes. Second place will be able to claim $500 in AST credit, while 3rd place can claim $250 in credit. AST Suspension credit may be redeemed toward the purchase of any new AST 4100, 5100, 5200 or 5300 series dampers, or Moton Club Sport, 3-Way, 4-Way dampers. Alternatively, the credit can also go towards the rebuild of current AST/Moton dampers. The program will be made available immediately to all NASA competitors across all classes listed. For complete details on the new contingency program, please visit http://www.nasaproracing.com/contingencies. Napa Valley, CA (February 22, 2016) — The National Auto Sport Association (NASA) is pleased to announce the new 2016 Hawk Performance Contingency Program. Although it may look like the same program, there is drastic change this year that should be very well received by the NASA community. NASA competitors are now eligible to combine certificates they win toward the purchase of a single axle set of brake pads. Not only are competitors eligible to win up to $150 per weekend toward the purchase of Hawk Performance products, they can combine those rewards toward their purchase. The program awards 1st place finishers with a $150 in Hawk bucks for a race win while 2nd and 3rd are eligible for $100 and $75 respectively. The program will be made available immediately to all NASA competitors across all classes. For complete details on the new contingency program, please visit http://www.nasaproracing.com/contingencies. NAPA VALLEY, CA (February 12, 2016) – The National Auto Sport Association (NASA) is pleased to announce the continued support of the BF Goodrich Tires Contingency Program for NASA competitors in 2016. The program will provide tires to NASA competitors competing both regionally and at either NASA Championship event. 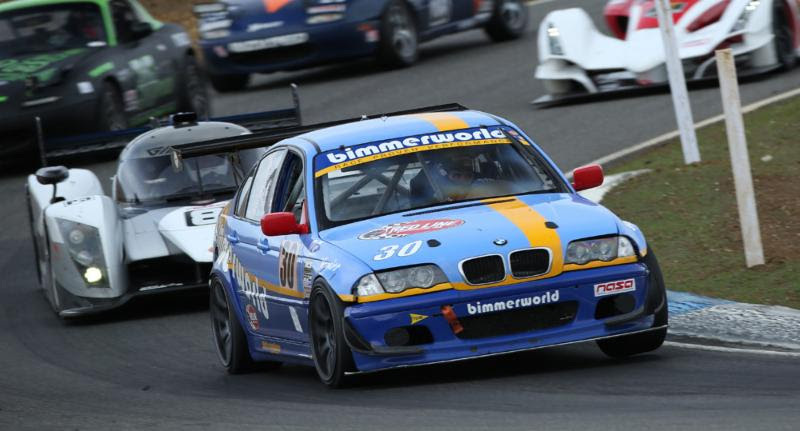 The program provides tire awards to American Iron Extreme, German Touring Series, Performance Touring, Super Touring, Super Unlimited, ES, ESR, E0, E1, E2 and E3 classes. Napa Valley, CA - (February 5, 2016) NASA competitor and Regional Director Dave Balingit, has been appointed as the National Series Leader for NASA's Prototype series. Balingit will concentrate on growing the series from the twenty-three cars currently purchased to several hundred, and will assist Jeremy Croiset, NASA director of Business Development, with management of the NASA Prototype series. "My first task to ensure a smooth and growing program is to keep gathering feedback from competitors.” Balingit said. “I’ve always had good relationships with fellow racers and I look forward to being the main line of communication between the teams and the NASA National Leadership." The NASA Prototype is a new classification to NASA, expanding their history of affordable local racing into purpose built prototype style race cars. The NASA Prototype class is built around the new Élan NP01 designed from the ground up to be quick and great looking - but more importantly, safe, reliable and inexpensive to race. Beginning in 2016, the NASA Prototype Series will visit many of the country’s greatest racing venues with an innovative rules package focused on affordability, equal competition, and driving ability. As with the other NASA Series Leaders, Balingit will be an active racer in the class. Balingit and his wife Revkah purchased a new Élan NP01 last September after test driving the Élan NP01 demonstration car. They took delivery of the kit in mid January and opted to go the route of building the car from the ground up to gain a deep understanding of the vehicle. They are nearly complete with the build and plan to race it at NASA Texas in mid March. Balingit has been involved in road racing his entire life and joined NASA in 1994. He has raced and also has been an HPDE instructor and a Race Director for the blossoming organization. After moving from California to Colorado, Balingit and his wife launched the Rocky Mountain Region in 2005 and have grown the program from 40 cars on its first competition weekend to several hundred at current events. Balingit also served as the Event Director for the NASA National Championships in 2009 and 2010 when the event was held at Miller Motorsports Park in Tooele, Utah. Many in the Texas area may also recognize Balingit as the interim Regional Director for Texas from 2011 to 2014. The Élan NP01 is unlike anything currently available in motor racing. With a complete kit price of just $72,500, the affordable new racecar features a closed cockpit design for increased driver protection. The Élan NP01 has an estimated dry weight of just 1,450 lbs. and boasts an estimated top track speed of 155 mph. The Élan NP01 is powered by a sealed 185-horsepower, two-liter Mazda power plant mated to a six-speed Sadev sequential gearbox. More information about NASA's new NASA Prototype Series and the Élan NP01 is available at www.NasaPrototype.com and ElanMotorsports.com. 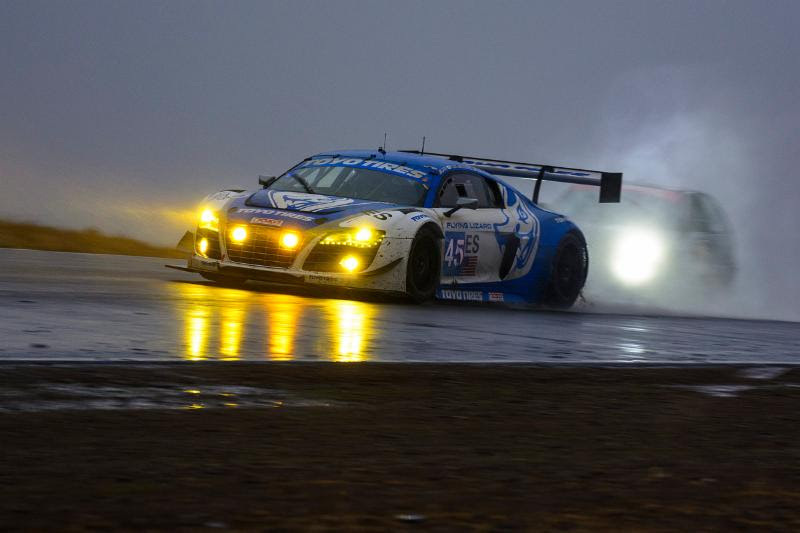 WILLOWS, Calif. (Dec. 6, 2015) - The 13th running of the NASA 25 Hours of Thunderhill presented by Hawk Performance was won by the Flying Lizard Audi R8 LMS in dominant fashion. When the checkered flag dropped on the twice around the clock plus one hour race at Thunderhill Raceway the Audi had won by 35 laps. The dominant Flying Lizard team took the overall lead seven hours in to the race Saturday evening and never looked back. When the defending race champions from Davidson Racing had issues with their Norma, the Lizards took over the lead and were never challenged for the remaining 18 hours. Soldering through on and off mist and rain through the night and a more serious weather front in the morning, the Audi R8 LMS with its traction control, ABS brakes and choice of two different Toyo tire rain compounds won the 13th running of the NASA 25 Hours of Thunderhill presented by Hawk performance by 35 laps over the second place car of Quick Racing and their No. 3 SuperLIte SLC. The winning entry was driven by Darren Law, Johannes van Overbeek, Guy Cosmo, Tomonobu Fujii and Thomas Sadler. "Excellent run by the team," Darren Law said. "The team is so good with this car and these long races. The Toyo tires were just phenomenal. We went from dry tires to wets, to intermediates and they performed great across the spectrum. We did what we set out to accomplish, winning in dominating fashion. Almost half of the race was run in the rain. The Toyo rain tire had us just hooked up. Their rain tire has a lot of grip which made it really fun to drive in those conditions." In ESR the No. 69 Gryphon Racing Praga took the victory with the all carbon Renault engine powered car driven by Joseph Barone, Danny van Dongen, Paul Blickman and Ari Straus. "The last 20 minutes of the race was our biggest drama, we lost a few seconds to position number four," Dusan Maly, team manager said. "Endurance racing is a full team effort with the crew and the drivers all performing. Whenever I see the rain it makes me happy. 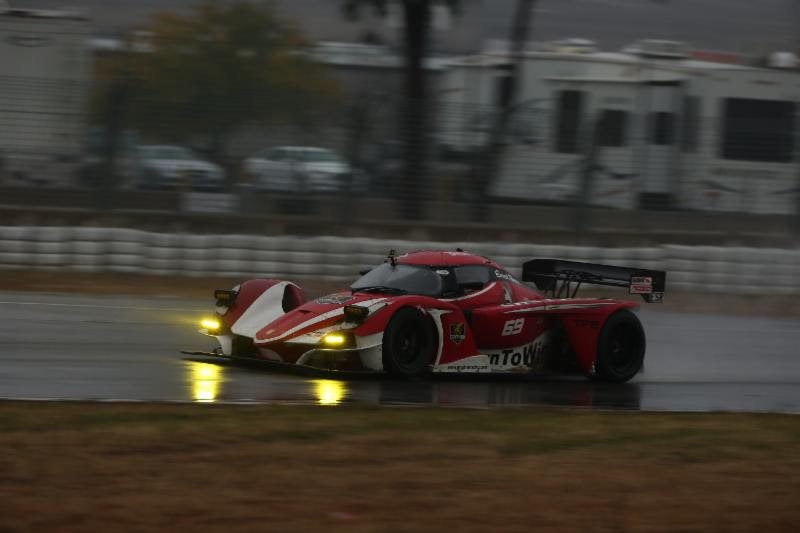 The Gryphon Praga is very good in the rain." In E0 the No. 30 El Diablo BMW took the victory with drivers James Clay, Lance Boicelli, Cameron Evans, Dale Sievwrig, James Colborn, Charles Postins. "Last Sunday the El Diablo guys were ready to throw in the towel on this effort," Cameron Evans said. "With the help of the team and everyone they got a car together that hadn't run in over 10 years to come out to the 25 hours and win. All of our guys at Red Line Oil and the rest of our sponsors, crew and volunteers did a great job. We knew we could have brought more power, but that wasn't the equation to win. We brought the right amount of car combined with fuel mileage and six drivers who knew what they were doing to win." In the E1 Class it was the No. 0 BMW of Grip Racing that took the win with drivers Tristan Littlehale, Joseph DePillo, Mark Mitchell, Harold Petit and David DePillo. "I had my friends in the 0 car and it was fun to watch them win," Jason Vein, team owner said. "We had some contact with the winning Flying Lizard car in the by-pass that resulted in breaking a couple of wheels and a tie rod. We made it back in and the crew did a great job to fix the car and get it back in the race. We had to serve a penalty for changing two wheels, but we were able to overcome that as well and get the win." In the E2 Class the RDR No. 34 Mazda RX-8 won the class with drivers Joel Miller, Lee Pappageorge, Dennis Holloway and Jeremy Barnes. "A repeat for our lovely RX-8 Kermit for the win," Joel Miller said. "Dennis Holloway put in the last stint and brought it to the checker. To get another victory for this great effort is special. Also really cool what the team did with getting the Mazda MX-5s all across the finish line in their first ever on track competition. Great effort all the way around by the RDR team with its all-volunteer crew." In E3 the No. 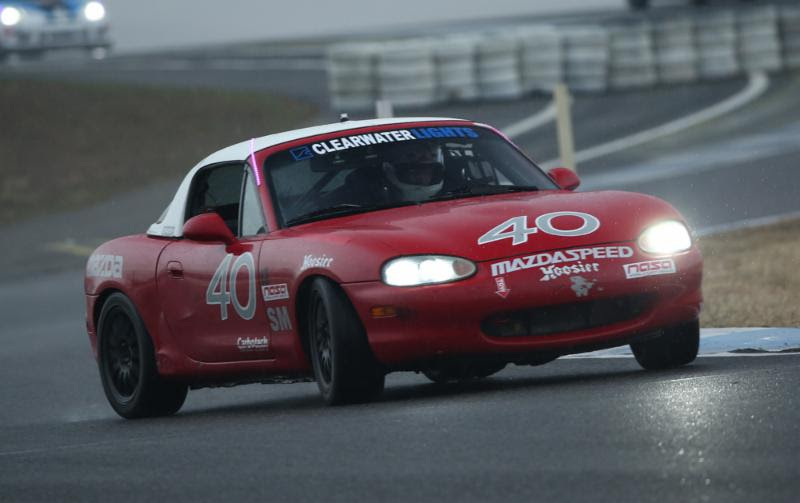 40 Mazda Miata of RAmotorsports40 won the class from the pole position with drivers Dion Johnson, Richard Lucquet, David Geringer and Doug Clark. "I have to thank all of my crew," Ron Gayman, team owner said. "I provided the car and along with the drivers they did the rest. I think the car was all four wheels off one time in 12 hours of rain. We ran 10 hours on one set of Hoosier wet tires. We did our best to run a consistent pace. We knew if we kept to our plan we would slowly, but surely pull away. We did not have any penalties between our two cars." The No. 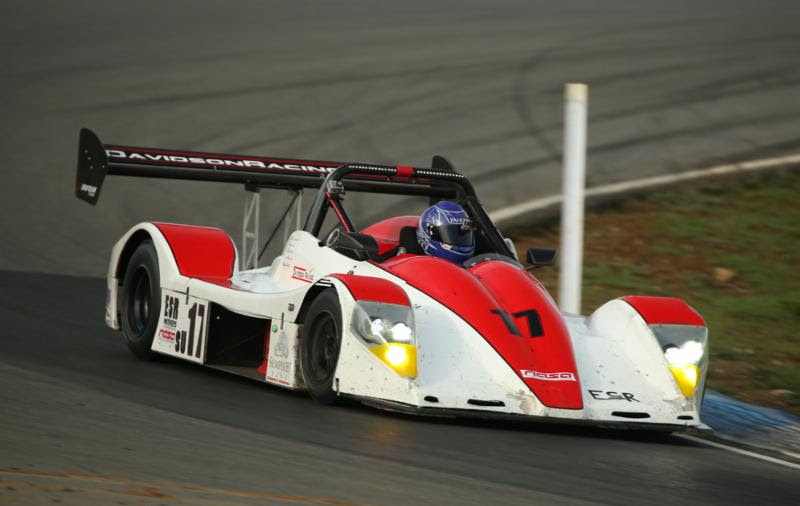 6 CLP Motorsports NP01 posted the first win in its competition debut with the NASA developed NP01 Prototype. The driving team consisted of Tyler McQuarie, Jeremy Croiset, Tom Dyer, Marc Miller and Pat O'Keefe. "This is a dream come true," Jeremy Croiset said. "We survived the 25 with a brand new car. I am in awe of the car and the team. It has surpassed everyone's expectations. When we clicked off the 500th lap the whole team celebrated. The NP01 was super predictable all race. The CLP crew did a great job with set-up and keeping up with the car mechanically all race. I am just elated." Professional drivers listed on the entry include: Al Unser Jr., Ryan Eversley, Kyle Marcelli, Randy Pobst, Burt Frisselle, Brian Frisselle, Dion von Moltke, Mike Skeen, Colin Braun, Kurt Busch, Johannes van Overbeek, Guy Cosmo, Darren Law, Joel Miller, Tommy Sadler, Sean Rayhall, Darren Law, Tyler McQuarie, Kelly Collins, Taz Harvey, Jeremy Croiset, Will Faules, etc. For additional information, please contact NASA Media Director, Kyle Chura at kyle@kcapr.com or (248) 821-0468. More detail on NASA and the Thunderhill 25 Hour can be found at nasaproracing.com or nasa25hour.com. NASA would like to thank its National sponsors for their continued support: Toyo Tires, Mazda, Hawk Performance, Winding Road Racing, and GoPro. We also want to thank MAZDASPEED, Honda Performance Development (HPD), Nissan, and Ford Motor Company for supporting our members. We greatly appreciate those companies that offer our racers contingency support, including Toyo Tires, AIM Sports, AST Suspension, BFGoodrich, Ford Racing, Maxxis Tires, Traqmate, Hawk Performance, Honda Performance Development (HPD), Hoosier Racing Tire, MAZDASPEED, Nissan, Jongbloed Racing Wheels, Bimmerworld, Frozen Rotors, Optic Armor, Neo Motorsports, Spec Clutches, Driven Racing Oil, Altronics Inc., ANZE Suspension, GT Radial Tire, Tilton, Racefab Inc., Sampson Racing Communications and Yokohama. NASA competitors can also get discounts from Mazda, Maxxis Tires, Racing Fire Systems, Ford Performance Racing School,Fuel Safe, Vehiport, APR Performance, Avis, Cruise America, Eibach Springs, Exedy, Fastbrakes, Konig, The Mid-Ohio School, Konig, Molecule, Red Line Oil, Winding Road Racing, Torco, TPIS, Porterfield and Monster Clutch. * NASA has over 14,000 members in 16 regions. * Key events include the NASA Western Championships at Mazda Raceway Laguna Seca, July 31 - Aug. 2; the Eastern Championships at Virginia International Raceway Sept. 4-6 and the season culminating NASA 25 Hours of Thunderhill, Dec. 5-6. * The NASA National Championships will run 36 race classes and nine Time-Trial classes during the event. 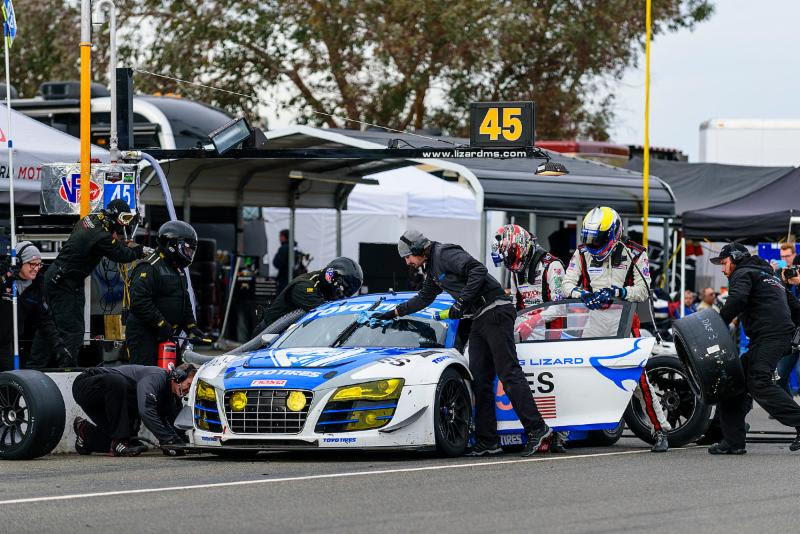 WILLOWS, Calif. (Dec. 6, 2015) - The 13th running of the NASA 25 Hours of Thunderhill presented by Hawk Performance has six hours remaining with the No. 45 Flying Lizard Audi still leading the race overall. The expected rain arrived at 2 a.m. with mixed results from the teams. The cars leading their class welcomed the challenge and increased their on track positions. The No. 45 Flying Lizard Audi, on the strength of two choices of Toyo rain tires, along with ABS brakes and taction control lead the race over second place by 23 laps. "This is quite an event," Guy Cosmo said. "We brought a serious effort this year. We are gathering a lot of great data on the Toyo tires, both in the dry, the wet and the intermediate weather. It is fun to drive this Audi out there in these conditions. Everyone has gotten into more of a rhythm. The other drivers know where we will be passing and there is just a better flow to the race. My stints have been great. We are on cruise control, we have a good lead so we are not taking any unnecessary chances. The conditions are stable, the tires are working great and we are just hitting our marks." In ESR the No. 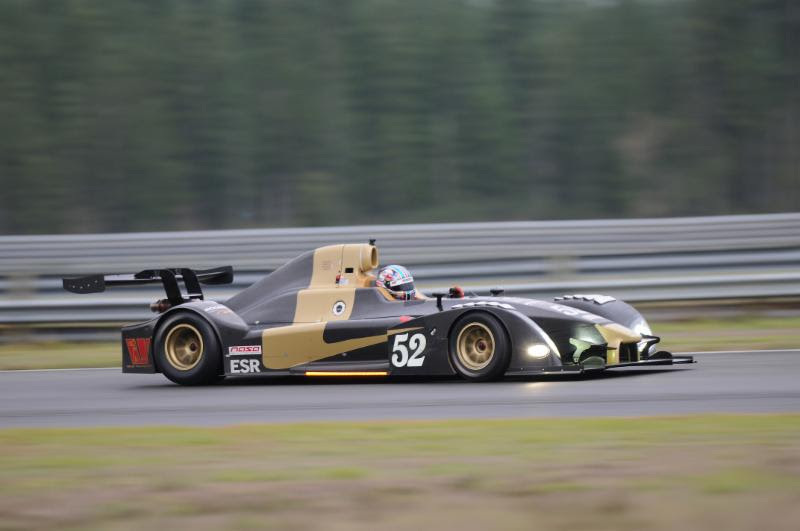 69 Gryphon Racing Praga continues to lead the class. The all carbon Renault engine powered car is performing at the top of the class and runs fourth overall. "We are leading the class and running fourth overall," Danny Vandongen, factory driver, said. "So far so good. We have to keep it on the track and keep turning laps. There is still six hours to go in the race. I haven't had any real issues with my time in the car. The rain came and we handled it well. We overtake a lot of cars, but everyone is behaving. I really like this track with the hills and blind corners." In E0 the No. 30 El Diablo BMW has taken over the lead. The team was on pole in class and raced to the front overnight. "It is pretty good stuff," James Clay said. "In the beginning we didn't have our pit stops right we were using a little too much fuel and we then got a rhythm going. We knew we would be good at night and in the rain and that has come true. The rain was a good thing for us. It is tough for me to be patient. We stayed out on dry tires, which we thought may have been the wrong call. The track began to dry and we made up time and then the rain came back, we cycled to wets and are leading. It couldn't have worked out any better." In the E1 Class, the No. 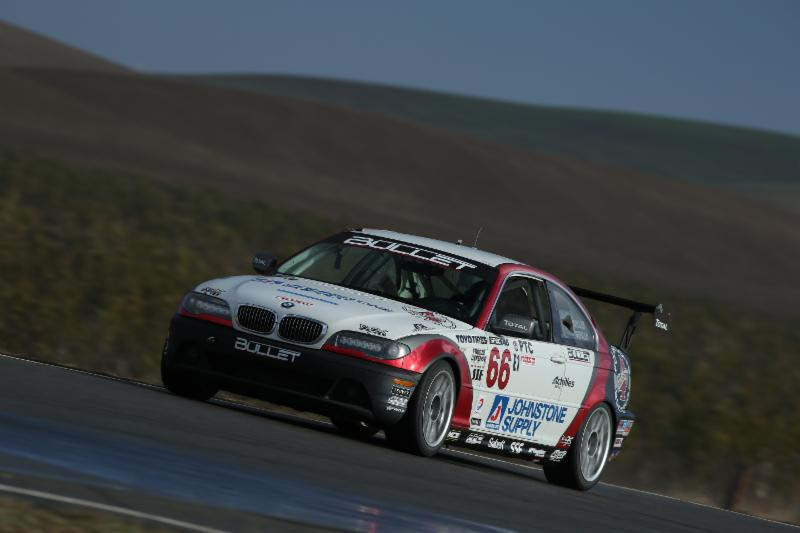 66 BMW of Bullet Motorsports continues to lead. "Our E1 car is really running well," Scott Lang, team manager said. "Our drivers have been very consistent and fast in the rain. Tristan Littlehale did a great job, he was doing 2:12s and 14s while everyone else was doing 25s. The rain was the best thing to happen to us so far." No. 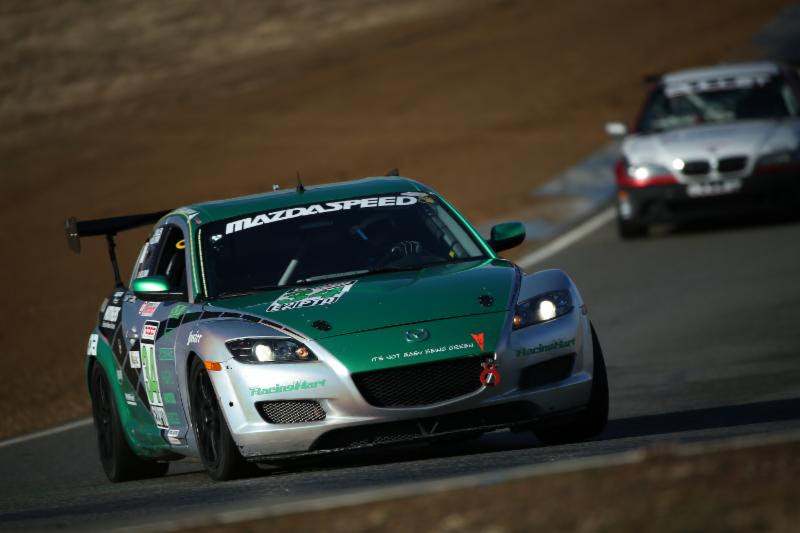 34 Mazda RX-8 of RDR Racing continues to lead the E2 Class. "The car ran really good in the rain," Joel Miller said. "We had a couple hours of mist, mixed with some really heavy rain. We've had a few issues along the way, but the RDR guys have handled those very well. Lee Pappageorge just got in the car and we are waiting for the sun to come up." In E3 it is the pole sitting No. 60 Mazda Miata of A+ Racing leads. "The car has been doing great," Richard Lucquet said. "I did a double stint. I had about 10 minutes of yellow during stint with the rest all green. I am getting ready to get back in and will be able to see the sun rise. I don't think I will be blinded, but looking forward to the daylight. The car has been great, somehow the steering wheel is at 10 o'clock instead of 12." CLP Motorsports continues to soldier on with the all-new NP01 Prototype. "They are great cars with a ton of potential, they are just brand new," Tim Barber, team manager said. "We couldn't be any meaner to them by putting it through its first race in a 25 hour event. We are getting some teething things that can happen with any car. In the wet we were one of the faster cars on the track, so we welcome some more rain." 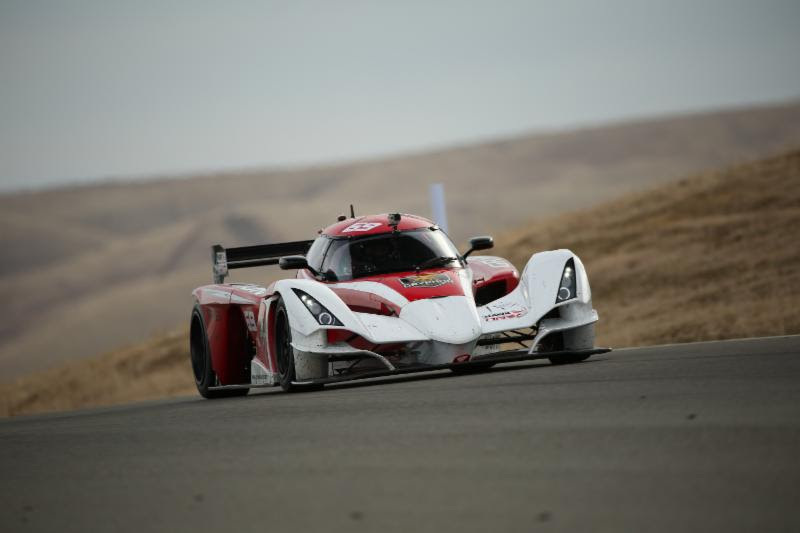 The NASA 25 Hours of Thunderhill presented by Hawk Performance will see a field of 63 cars racing in seven classes (ES, ESR, E0, E1, E2, E3, NP01) going twice around the clock plus an hour over the 2.86-mile, 15-turn track located 90-minutes north of Sacramento. WILLOWS, Calif. (Dec. 5, 2015) - The 13th running of the NASA 25 Hours of Thunderhill presented by Hawk Performance has reached the 12 hour mark with the No. 45 Flying Lizard Audi leading the race overall. As teams have one eye on the 2.86-mile, 15-turn track and the other the weather radar with rain heading toward the area sometime around 1 a.m. they are plotting their driver and team strategies. The No. 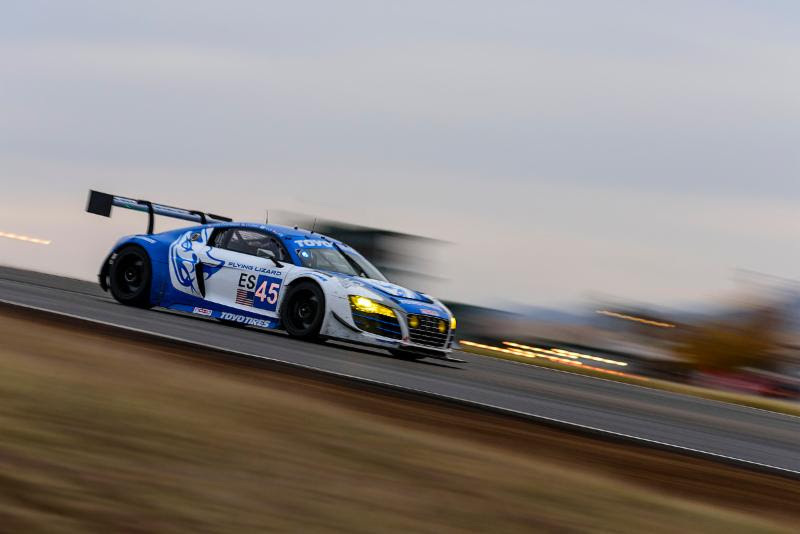 45 Flying Lizard Audi became the overall leader at the seven hour mark. The team currently is circulating with a 10 lap lead over second place. "We are in the lead and the car is really running well," Darren Law said. "The car, the team and the Toyo tires are all in sync. We are really just trying to run a pace and keep out of trouble. With the different speed differentials you really have to pay attention. We know the rain is coming. Good for us, we ran on Thursday in the wet. Toyo has an intermediate and a full rain tire, so we are ready. We actually are hoping for rain. Our Audi has ABS and traction control, which our competition does not." A new leader has emerged in the ESR Class. The No. 69 Gryphon Racing Praga entry has taken over at the front of ESR. "We are running first in the ESR class and I am getting ready for my second stint," Ari Straus said. "I had a few issues here and there in my first stint. Gryphon Racing has put together a great Praga race car for us. I may see some rain during my run. We are ready for those conditions, we just have to keep speed coming over the wing." In E0 the No. 61 RoadShagger Racing BMW leads the class. "Good news we are still in the lead in E0," John Morley said. "The car is not extremely fast right now, but it is reliable. The car owner Gavin Ernstone is in the car and doing a great job. No real drama during my run. The car's handling is all over the place at the moment. When the rain comes we will find out what we have. We have rain tires and a plan, hopefully it goes according to that plan." In the E1 Class, the No. 66 BMW of Bullet Motorsports has taken over the lead. "The car is working really well," Tristan Littlehale said. "I just did a double stint. I was right behind the Award Motorsport Porsche when it went into the wall with the Miata. I escaped that drama, so pretty good. Our plan for the rain is to keep it on the track and get to the morning." "We are just turning laps in the lead of the E2 Class," Dennis Holloway said. "We had some contact coming over the hill earlier and bent a tie-rod but we got that fixed. Everything seems to be good right now. I think the rain is going to skirt a little bit to the north. No, I think right when I get in it is going to start rain and I will have to go from slicks to wets, so that will be fun." In E3 it is the pole sitting No. 40 RAmotorsport Mazda Miata has taken over the lead. "We have had some challenges, but we are in the lead right now," Scott Miller, team manager said. "We have had some parts come loose, tire wear that we didn't expect, fuel economy that hasn't quite worked out, the usual stuff. A long way to go. It is going to rain, it is coming. The rain is not going to fall within our tire cycle right now, so we have to figure that out. 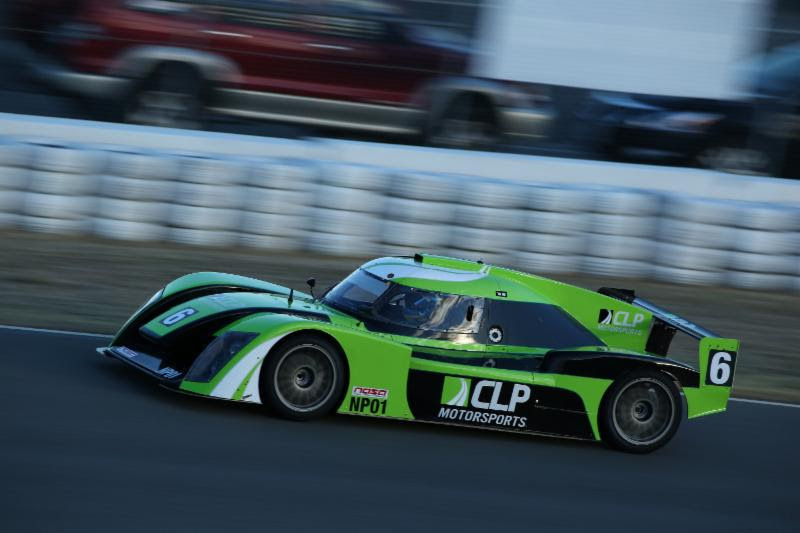 CLP Motorsports remains the leader in the all-new NP01 class. "It is going pretty well for us with this new car," Jeremy Croiset said. "We expected some teething issues with a new car and its first time in competition. This is a race that eats even the most seasoned race cars for breakfast. We have rain tires mounted and we are going to do some shock adjustments and see what the 25 has in store for us in the wet." WILLOWS, Calif. (Dec. 5, 2015) - Officially 58 cars took the green flag for the start of the 13th running of the 2015 NASA 25 Hours of Thunderhill presented by Hawk Performance today at 11 a.m. The No. 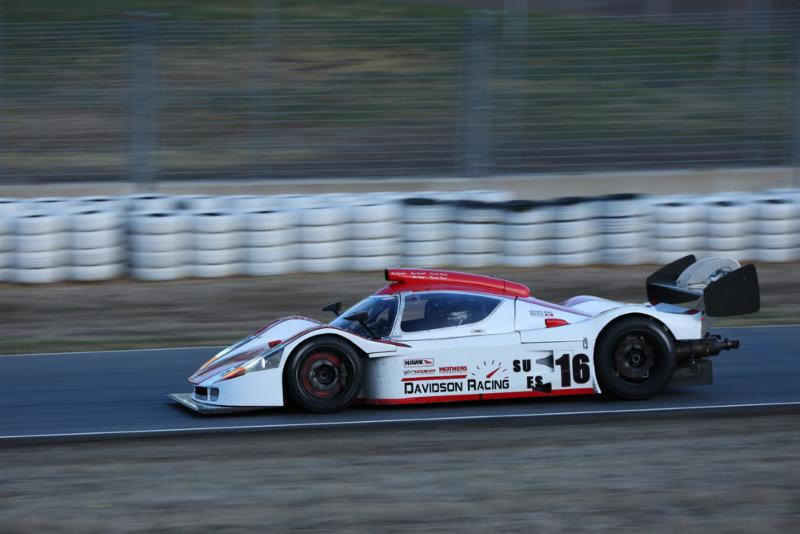 17 Davidson Racing Norma, last year's overall winner, has led the race from the start. They nearly gave up the lead four hours in when the NASA officials called them to pit lane to serve a 10-minute penalty for passing under yellow. This allowed the second place runner, ES Class No. 45 Audi of Flying Lizards, to make up four laps and get on the same lap as the 17. At six-hours it is the 17 out front with rain expected by 2 a.m.
"I had a good start to the race," said Brian Frisselle. "It opened up for me and I was able to take the lead. I then settled into a pace and was able run pretty comfortably upfront. We had to take a 10-minute penalty when Kyle Marcelli passed under yellow, which erased the few laps lead we had, but we are back to running upfront. Everything is going great with 17 car." In ES the No. 45 Flying Lizard Audi is one lap behind the leading Davidson Norma. "I did a double stint, I was second in the car," said Tomonobu Fuji. "There were three caution periods during my stint, so it was a little crazy. The Toyo Tire is really good here. My stint was very consistent thanks to a good car, good tire and good crew. There is always traffic out there, so you have to really pay attention. We ran in the rain on Thursday and the car was good on the Toyo rain tire so we are ready." "It is going very well we are leading our class," Gavin Ernstone said. "We had some issues yesterday. We were a little disappointed qualifying fourth, but we have progressively moved into the lead. We have had good driving and good pit work and everything is going according to plan. The rain will add some excitement and bring out a different level of driving talent." In the E1 Class, the No. 14 Technik HQ Autosport/Active PDF BMW is at the front. "The start was really, really good," said Peter Hopelain. "We picked up four positions by Turn 1 on the first lap. We then settled into a pace and were running good. On lap 10 I had a prototype come up on me and I had to go off the track and that put us back about 30-seconds. We changed up our strategy a little. We fell back to fifth, went back into the lead and we are strategically placing our car forward. I want to thank our sponsors Active PDF and Ocean Side Motorsports. They have done a stellar job giving us a great driving car. Without those two companies we would not be here." The E2 Class is being led by the No. 34 Mazda RX8 of RDR Racing. "So far so good, we really haven't had much drama," Robert Davis, team owner said. "We are leading with the RX8 and the new Mazda Miata MX-5 Cup cars are a little over classed. We are fighting amongst ourselves with those. This race is a whole season of the MX-5 Cup series. We have about 900 miles on the cars so far with no issues. The rain keeps getting pushed back, so we will see how it goes." In E3 it is the No. 13 SP Racing Miata in the lead. "The first stint was challenging with all of the traffic out there," Hernan Palermo said. "I had a little issue and had to come in and do a fast front end alignment. I hope to see some rain that can only help us." 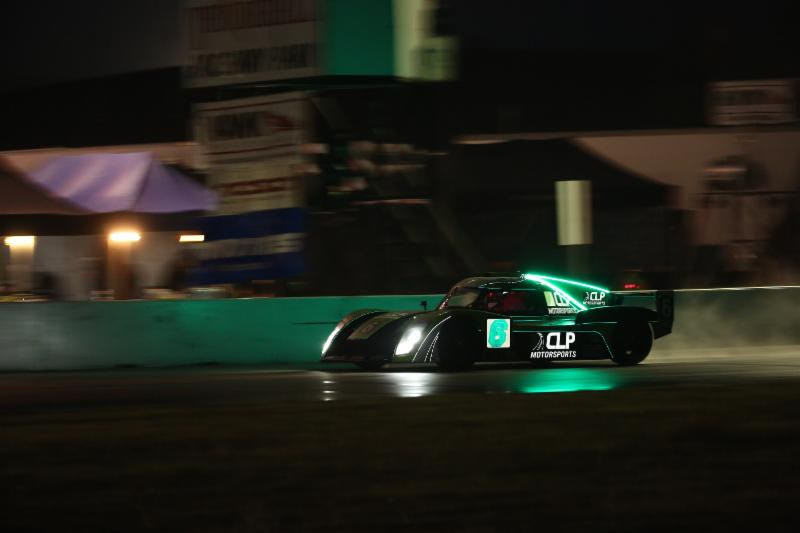 In the new NP01 car, CLP Motorsports continues to lead. "The start of the race was good," Tyler McQuarie said. "We didn't get involved in anyone's mistakes. We have struggled with axles a little, but I think we have it figured it out. The car is running pretty good right now. We did a few laps in the rain during the test day. We made some set-up changes anticipating the rain and I think they will put me in to slide it around when it gets wet." WILLOWS, Calif. (Dec. 4, 2015) - Sean Rayhall will lead the 63 car field to the green in the No. 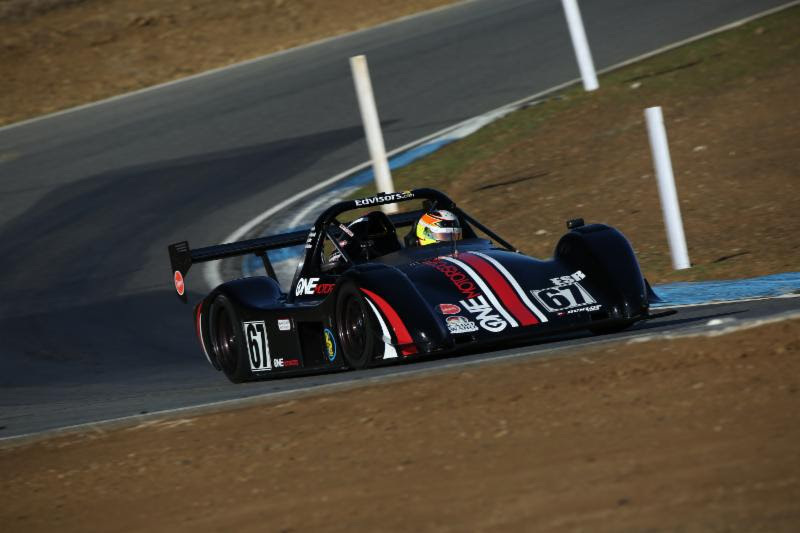 67 One Motorsports Radical for the 13th running of the 2015 NASA 25 Hours of Thunderhill presented by Hawk Performance for tomorrow's 11 a.m. start. Under near perfect weather conditions of 50 degrees, the 63 car field took to the track at 5:15 p.m. PT for a 30-minute qualifying session. Throughout the half-hour the battle for the overall pole position was between the Radical No. 67 of One Motorsport and the Ryno Racing No. 8 Ginetta LMP3 car. Knocking on the door of the event pole in third was last year's overall winner the No. 17 Davidson Racing Norma. When the checkered dropped on qualifying it was the ESR Class Radical of One Motorsports taking the pole with sports car ace Sean Rayhall at the wheel. He will lead the 63 car field to the green for the 13th running of the 25 Hours of Thunderhill presented by Hawk Performance with a time of 1:40.275. "It is awesome to get the pole for One Motorsports this year," Rayhall said. "They haven't had one for a few years. We came up short in the rain last year. It is hectic as usual there, just a ton of traffic. You have to pick your spots to pass and get a good exit off the turns. It is tough this year, you don't know who is in the cars. You see one Miata and then the next one has more horsepower so you really don't know sometimes. This race is about survival, not fast lap times. The pole means nothing for the long run. We need to keep the fenders on the car and go the distance. The team has done a lot of work on the endurance aspects of the car for this year." In the ES Class Burt Frisselle drove the No. 16 Davidson Eagle to the class pole with a time of 1:43.501. "The car ran really good," Frisselle said. "It is always interesting qualifying here for the 25 because it is in the dark. The whole field is out there at one time. Less stressful than last year without the rain so it was good. We had to keep it clean. We decided to go with a softer tire compound. I may have run it too hard before qualifying, but we got the job done. I can't wait until 11 a.m. to roll around tomorrow." In E0 it was the No. 30 El Diablo BMW driven by James Clay who took the top spot with a time of 1:54.296. "It is always a little hairy out there qualifying at night," Clay said. "There are a lot of cars on track and there are a lot of quick ones. My car was cold so my first couple of laps I was just praying to stay clean. I was able to get a good lap and didn't get held up and put one together. We are not going to run that pace in the race. We have an old world challenge car we resurrected so we are good. We have six guys driving all good guys and we are going to have some fun." The No. 0 BMW driven by Mark Drennan, double 2015 NASA Spec Miata Champion, put the red and white car on the E1 pole with a lap of 2:00.314. "It was great, we got a fantastic result," Drennan said. "I haven't driven in the dark in a while so it was a little disconcerting for a lap or two. They have changed the light rules this year, so it was a little tough to pick up my points. I ended up just barely on pole. 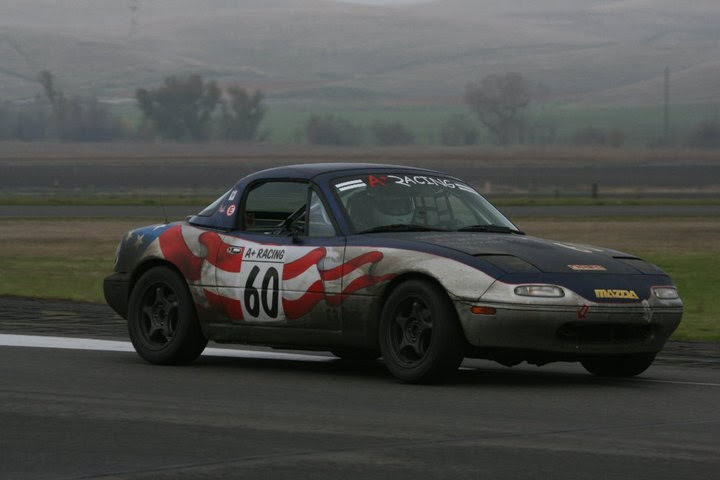 I have been racing a Spec E46 all last year, so compared to a Miata it is a lot different. Our strategy is to keep the car on the track all of the time and finish." Joel Miller drove "Kermit" the green No. 34 Mazda RX8 to the pole position in the E2 Class with a time of 2:05.396. "I started where we finished last year," Miller said. "My spotter was able to get me a gap on the track and I got a fairly clean run. We are just doing our thing here at Mazda. Kermit has one win, so we are trying to get RDR and Mother's another win. I usually drive the Mazda P2 car in IMSA and I tell everyone that this event is a lot of fun!" The No. 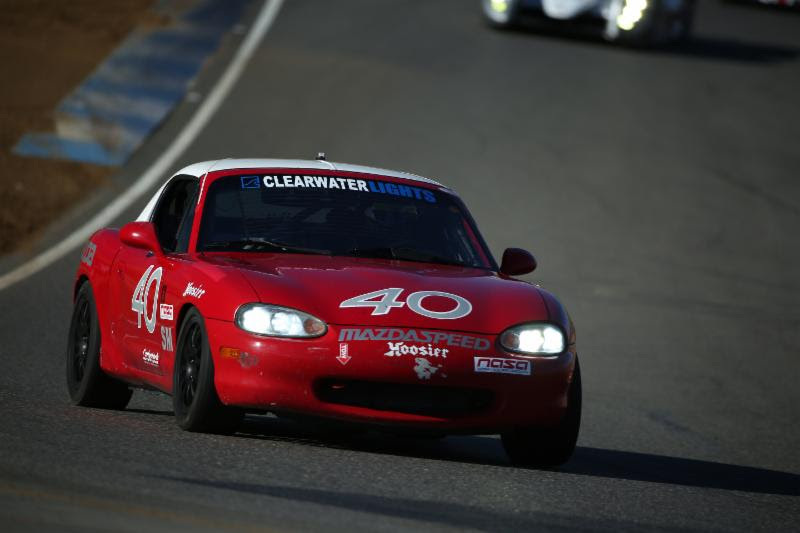 40 of RAmotorsports40 Mazda Miata was driven by Darren Polsley to the E3 Class pole positon with a time of 2:06.635. "I didn't really get a clean lap with all of the traffic," Polsley said. "The car is so good, I guess it was good enough for the pole. Our strategy is to survive until the rain Sunday morning and then survive the rain. It is a balance between pace and longevity, we need to strike the right balance." Marking its first on track competitive appearance is the all-new NASA developed NP01 Prototype. Tyler McQuarie drove the No. 6 NP01 of CLP Motorsports to the class pole with a time of 1:52.079. "It is the first time getting the NP01 on track in competition," McQuarie said. "There is not a lot of open track out there with all of the cars. You really need to keep the momentum going with the NP01 as it doesn't have a lot of torque. I think our time put us in the top 10 overall, so not a bad start to the weekend. We are first in class, so we will take it. We are going to focus on just keeping the car together. The car is brand new, so we just need to be mistake free and make it to the end." Professional drivers listed on the entry include: Al Unser Jr., Ryan Eversley, Kyle Marcelli, Randy Pobst, Burt Frisselle, Brian Frisselle, Dion von Moltke, Mike Skeen, Colin Braun, Kurt Busch, Johannes van Overbeek, Guy Cosmo, Darren Law, Tommy Sadler, Sean Rayhall, Darren Law, Tyler McQuarie, Kelly Collins, Taz Harvey, Jeremy Croiset, Will Faules, etc. 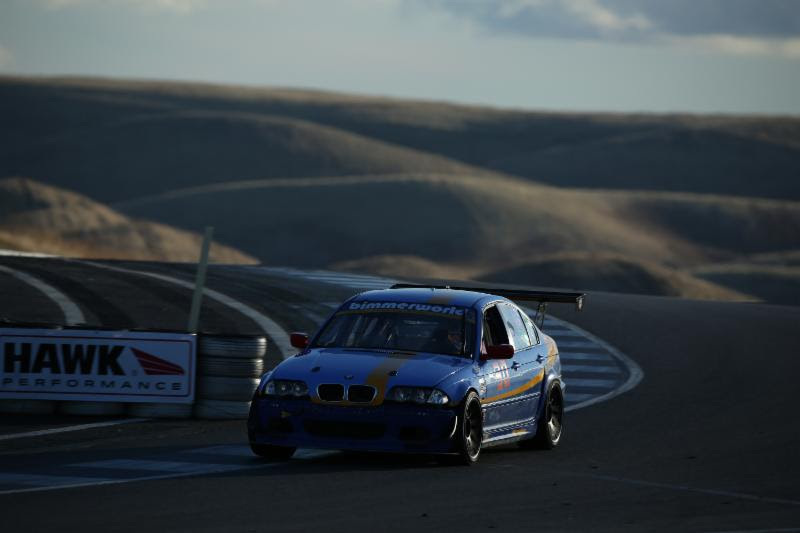 NAPA VALLEY, Calif. (Dec. 2, 2015) - The 2015 NASA 25 Hours of Thunderhill presented by Hawk Performance will run this weekend at Thunderhill Raceway in Willows, Calif. The 13th running of the now 25 hour classic will take the green flag at 11 a.m. on Saturday. After two years, with the score tied between the dealers and employees, this year is about the bigger picture of teamwork and debuting the new 2016 Mazda MX-5 Cup race car. "While we joke about the rivalry between the factory guys and our dealers, the truth is that our success is directly linked," said Robert Davis, Mazda's senior vice president of U.S. Operations, of the company's official four-car 2016 Mazda MX-5 Cup entry. "For 2015, we are allowing a very select group of dealers AND employees to race alongside each other in the new 2016 Mazda MX-5 Cup car. While the development testing by Long Road Racing has been superb, nothing compares to a bunch of club racers beating on each other for 25 hours to really test the hardware." 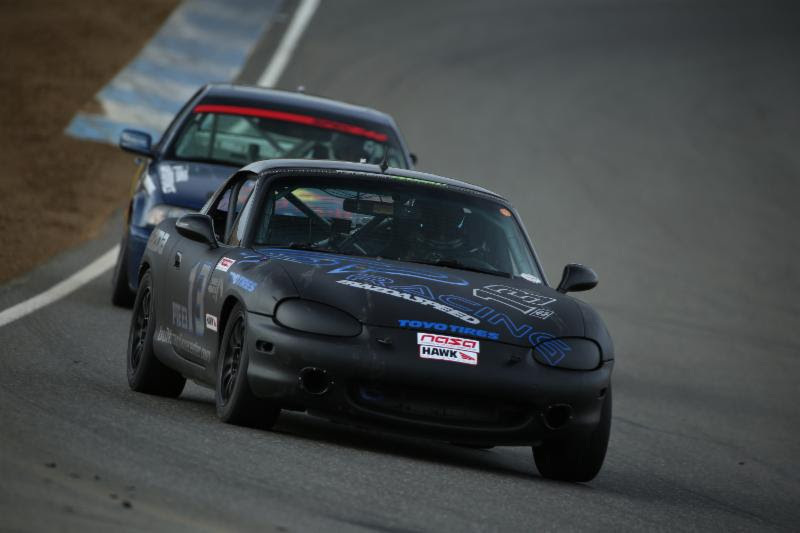 The team will race four brand new 2016 Battery Tender Mazda MX-5 Cup spec cars, with the only changes being the installation of additional lights for the very dark Northern California track. One of the 15 drivers that will be piloting the recently introduced Miata MX-5 is Mazda dealer and seasoned sports car driver Taz Harvey (Dublin Mazda, Tracy Mazda, Dublin/Tracy, CA). "I have run a dozen or more 24 hour races over the years, but the NASA 25 hours is always special," Harvey said. "Thunderhill has become my home track, I love that place! My last win was in 2010 in a MX-5. 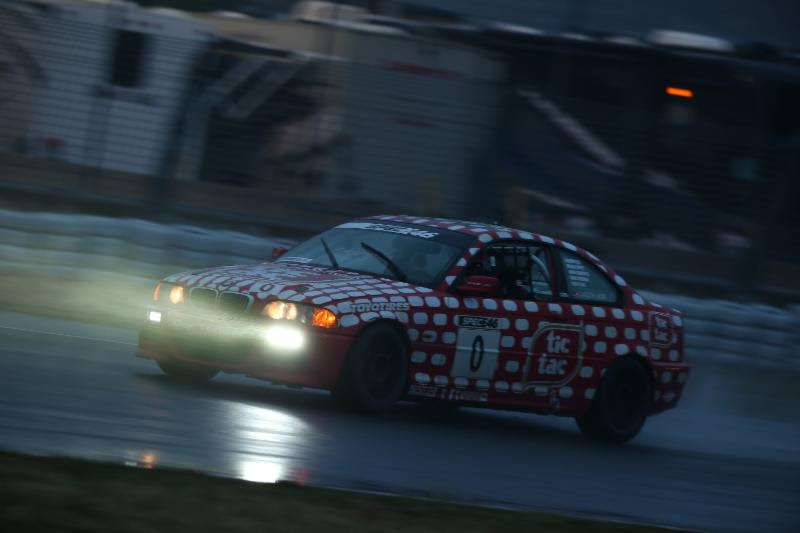 My most memorable was when Roger Foo and I won the NASA Timex 12 hour race in a 120 horsepower Civic thanks to the rain and cold. The new MX-5 should be faster than the previous generation as it is lighter and has about the same power. The BMW's will have horsepower on the MX-5 so we have to beat them with fuel economy, better handling and skill. 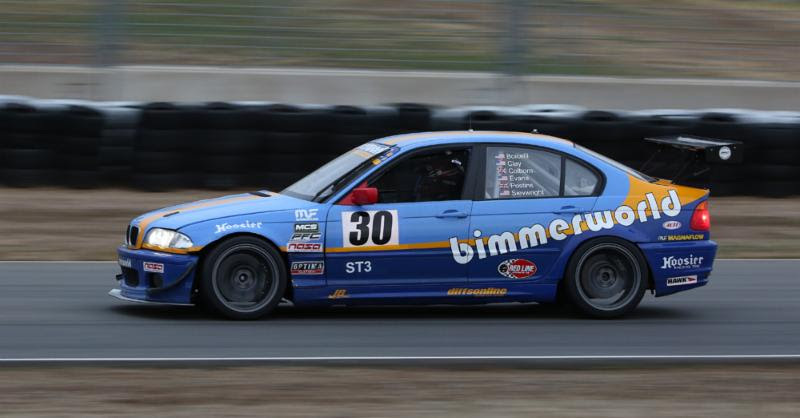 Thunderhill is a fun race with a great mix of cars and drivers from all over the world. The night time running and harsh conditions make it tough and memorable." Randy Pobst was a part of the overall Davidson Racing winning team last year and is returning with the same goal this year. "I am thrilled to be back in the Davidson Norma to defend our overall win last year," Pobst said. "To win again will take brains, we've got the speed. If we push the Davidson Norma too hard, we'll tangle with slower cars and invite mechanical trouble. Racing smart is keeping risk low and having lots of patience. On the driving side we will have to have a lot of discipline finding a pace that's quick enough with low risk, and the patience to stick to it. Our unintentional secret last year was shifter problems early. That issue led us to a minimal-shifting strategy, which I believe was a big part of our mechanical survival, along with terrific prep by team Davidson. Our competitors kept waiting for the sports racer to break, which truthfully, they often do, but our well-built car kept right on rolling. It was great to have team owner Bob Davidson take the checkered in the last stint." The group at Team Honda Research is back this year with a three-car effort. "This year we have rebuilt our tried-and-true Honda Civic," John Whiteman, team leader said. 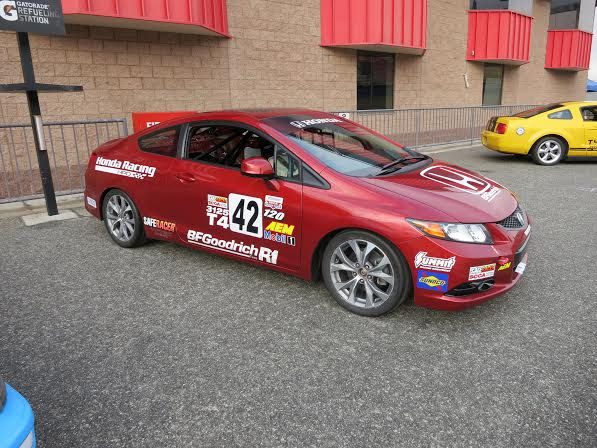 "We will race one Civic along with the two Acura ILX's that we have raced for the last two years. This is an in-house effort comprised of Honda associates from around the world. We work on the cars in our spare time and on weekends. It is great to take a street car and make it race ready to take on 25 hours of great competition. Our team is made up of crew chief Mike Aylward and our driver line-up includes Doug Chan, Kevin Boehm, Kazuo Omura and Calvin Tam." 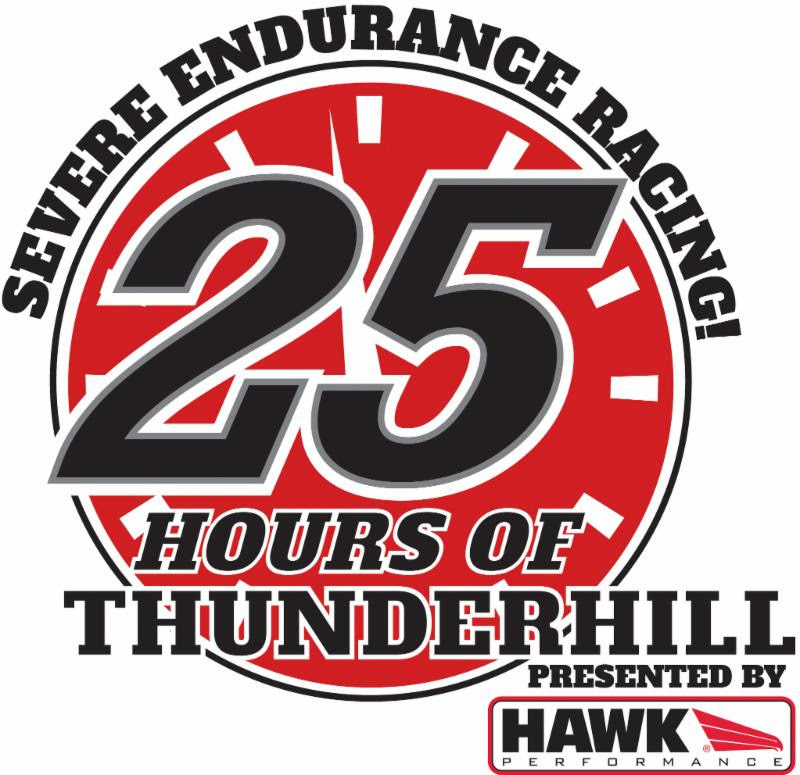 th running of the 25 Hours of Thunderhill presented by Hawk Performance. "The teams are starting to file in and park, which means our 13th running of the 25 is upon us," Kunzman said. "The Mazda grudge match is back with the all-new Mazda MX-5 and there are great cars and teams in each of the seven classes. 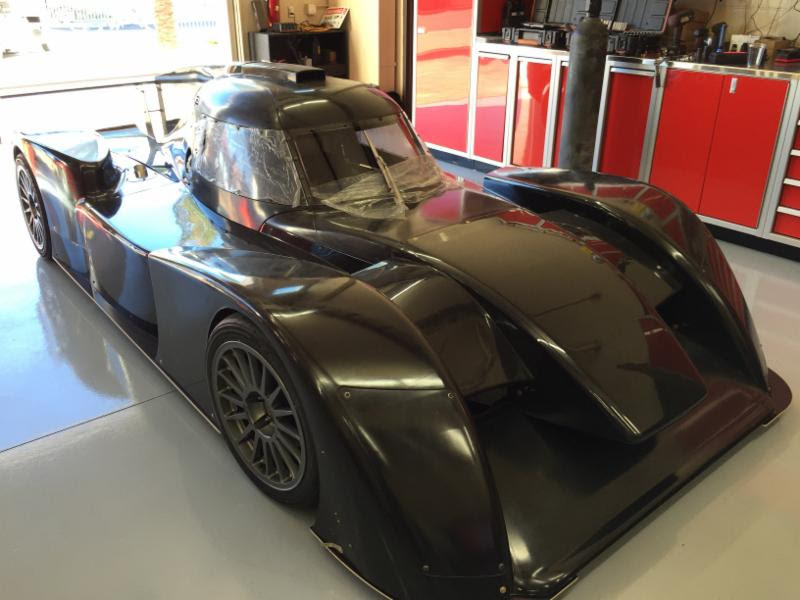 We have added a seventh class this year with our new NP01 prototype competing. The car is getting rave reviews in the press and I am very interested to see how it performs over 25 hours this weekend." Professional drivers listed on the entry include: Al Unser Jr., Ryan Eversley, Kyle Marcelli, Randy Pobst, Bert Frisselle, Dion von Moltke, Colin Braun, Kurt Busch, Johannes van Overbeek, Guy Cosmo, Darren Law, Tommy Sadler, Sean Rayhall, Taz Harvey, Jeremy Croiset, Will Faules, etc. 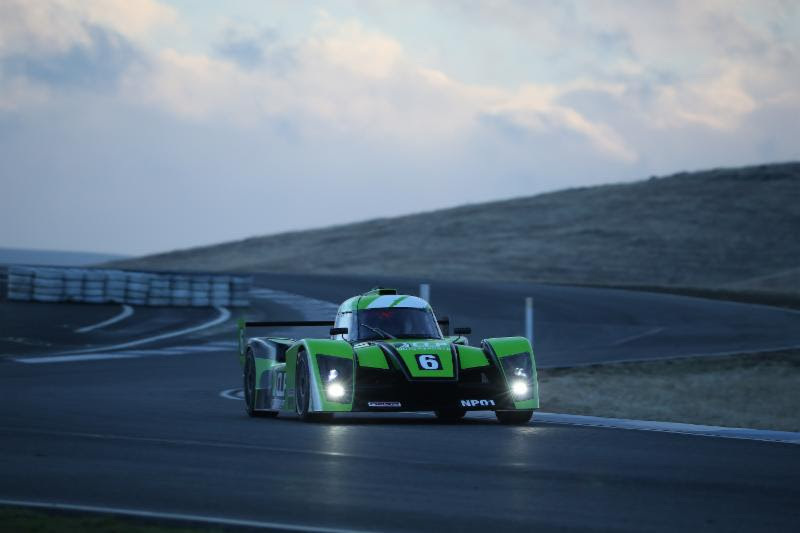 NAPA VALLEY, Calif. (Nov. 24, 2015) - The 2015 NASA 25 Hours of Thunderhill presented by Hawk Performance is drawing some fast entries in all six classes. The 13th running of the now 25 hour classic will take the green flag December 5. 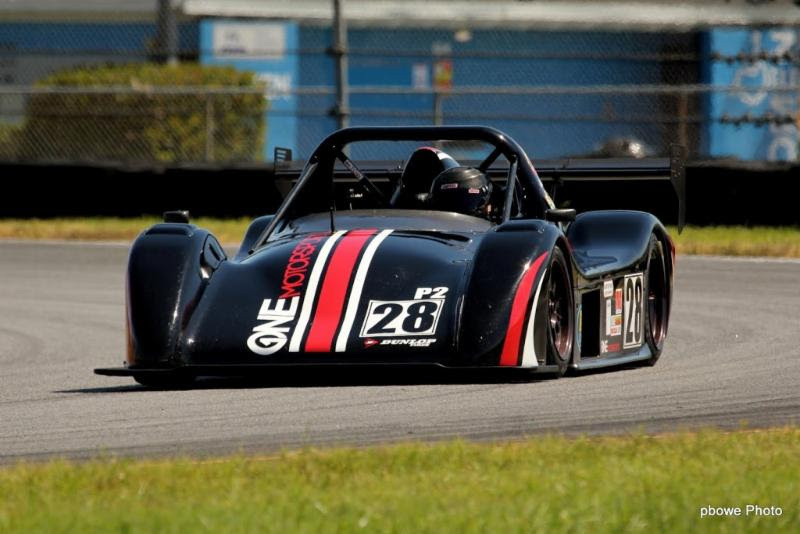 In the ES class, Wolf Cars and One Motorsports are sure to be at the front of the field throughout the weekend. Wolf Cars North America is coming back with their GB08MJ. Driving the car will be team owner, Miles Jackson, IndyCar Champion Al Unser Jr., Pro Drive Racing School owner Todd Harris and Factory Honda Driver Ryan Eversley. The team has made extensive changes to the Wolf and are ready for the 25. "The car we are racing this year is the same Wolf GB08MJ chassis that we ran last year, but with Honda power," Brian Roberts, director of operations, Wolf Cars N.A. said. "The Wolf GB08MJ is a single seat sports racer built in Italy, with a full tunnel floor for aerodynamic down force. The engine is a Honda Racing, HPD Formula Atlantic built K20, 2-liter naturally aspirated four-cylinder." The Wolf GB08MJ has been very competitive the last two years at Thunderhill. "We evaluated the issues from the last two years and put a different overall formula together," Roberts continued. "More like the story of the tortoise and the hare, we just replaced the tortoise with a Wolf. We are happy now to be working with Honda Racing. We have a reliable Honda power plant. The K20 has been used in many of the CN cars from Europe and has powered those cars with great reliability. We are focused on reliability and fuel consumption. We have a lot of planning, preparation and testing of all the systems and components for many types of conditions to be ready for December. Talented, smart drivers and crew keeps everyone on task. You can't win if you don't finish. The biggest obstacle for most teams at the 25, including ourselves, is getting to the finish and keeping the car out of any on-track incidents. You can't work on going faster if you are fixing damage on the car." Another formidable contender every year is One Motorsports with their ultra-nimble Radical. "We are running one car this year in the 25 hours with drivers John Falb, Todd Slusher, Sean Rayhall and myself," said Jeff Shafer, team owner. "We have prepared this year by running the car more in testing than we ever have before. As in past years, we are planning for the best but preparing for the worst. Our biggest obstacle will be the unknown, you never seem to know until it's happening. It could be the wet or the cold or our car or other cars. We are just trying to be prepared for any situation." There are two of the all new NASA/Elan developed NP01 race cars entered for the 25. The team at NASA/Elán NP01 Prototype Team No. 01 is taking a unique approach to developing their driver line-up for the twice around the clock plus one hour event next month. "We will be holding an open test on Wednesday, November 25 at The Thermal Club to test drivers for the race," Drake Kemper, team manager said. "We are going to be basing the test on four main aspects, consistency, smart decision making, overall speed, and attitude. We are documenting the complete event, from building the car to the test and through the race weekend." Jerry Kunzman, NASA executive director, is pleased with the quality and quantity of entries. "I think this grid will be the strongest we have seen in the 13 years of running the the NASA 25 Hours of Thunderhill presented by Hawk Performance," Kunzman said. "We have the defending champions Davidson Racing coming back. The Flying Lizard team members with Toyo Tires support this year have a lot of experience running the 25 and there are great cars and teams in in each of the six classes." 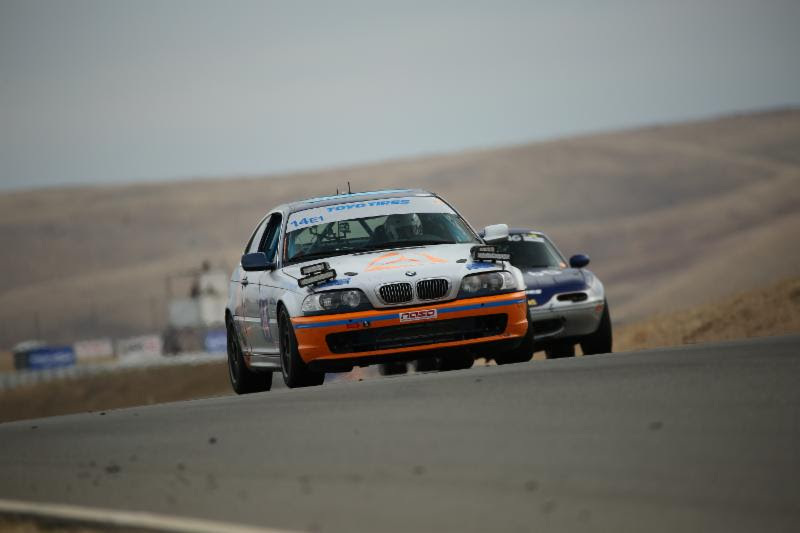 The NASA 25 Hours of Thunderhill presented by Hawk Performance will see a field of 63 cars racing in six classes (ES, ESR, E0, E1, E2, E3) going twice around the clock plus an hour over the 2.86-mile, 15-turn track located 90-minutes north of Sacramento. Hawk Performance is a leading supplier of severe duty and high-performance friction products manufactured in ISO-certified facilities for the motorsports and performance automotive aftermarket. Hawk Performance products are engineered to allow users to control, command and conquer the terrain for which their vehicles are designed. Decades of experience in developing friction materials for aerospace, industrial, military, automotive and motorsports applications give Hawk Performance an advantage over the competition. In the past decade Hawk Performance friction products have won more motorsports championships than any other friction manufacturer. More information available at hawkperformance.com. Napa Valley, CA – (November 13, 2015) NASA and Elan Motorsports unveiled the first production version of the new class of purpose built race cars, the NASA Prototype (NP) series at the 2015 SEMA show. The Specialty Equipment Market Association (SEMA) in Las Vegas (Nevada, USA) is regarded worldwide as the leading trade show for customization and sports tuning. The products presented at SEMA to trade experts influence the entire scene and set trends. The 2015 SEMA show which ran November 3rd to 6th proved to be the perfect venue for the NASA Prototypes debut. NASA had the opportunity to work with our good friends at Toyo Tires & HAWK Performance this year, to introduce industry insiders and show attendees to the new purpose built race cars. The HAWK Performance booth was buzzing with activity as show attendees’ walked around examining this new class of cars built by Elan Technologies. NASA representatives’ on hand to support their partners eagerly spoke to dozens of folks interested in what the NP01 had to offer. Attendees’ were very impressed by the design and the cost effectiveness for running a vehicle that can be entered into several classes; Time Trials, Sprint, & Endurance Road Races. A point of key interest was the fact that 18 NP01’s have already been sold to date and they are already set to start racing in 2016 with the NASA NP Championship Series. “80 people jumped in the driver’s seat, proving that even big drivers could fit. The largest was 6’5” at 325Lbs and with the pedals out at its furthest adjustment point, he fit. We even saw a former F1, CART, IRL, GrandAM, NASCAR driver stop by and comment how much he loved the car. He giggled when he was told the price and said he wanted to be involved with the project in some way.” said John Mueller NASA Strategic Marketing & Project Manager. Everyone was very impressed with the final product and asked when the next track test day would be. The NP Series will offer something unique in all of motorsports - the opportunity to race a prototype style vehicle designed from the ground up to be fast, fun, safe, and most importantly affordable. This new series is exclusive to NASA. Drivers will be able to compete at any of the over 150 NASA sanctioned events nationwide. However, the main series will feature just 18 race weekends split into 3 areas across the country making it much easier for competitors to contend for a championship. The series will visit many of the country's greatest racing venues. The NP series will feature an innovative rules package focused on performance, affordability, cost containment, and showcasing driver ability. Lots of excitement in the crowd to get on track and race these new machines in the NASA 2016 season. 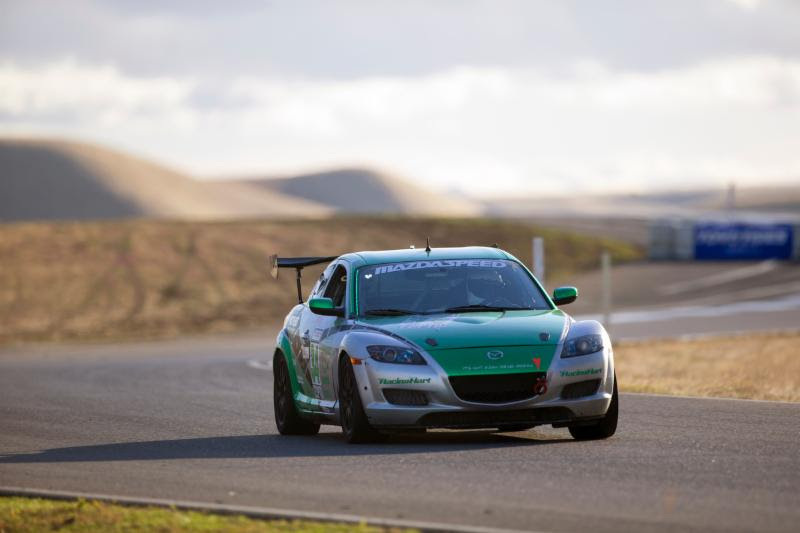 Napa Valley, CA – (November 4, 2015) – National Auto Sport Association (NASA) drivers continue to dominate the field of racers of finalist selected for this year’s 2015 Mazda Road to 24 Shootout. 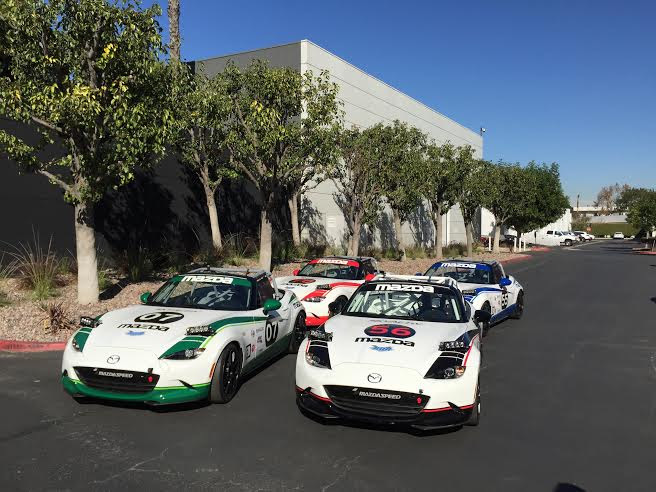 Five racers from NASA will be competing for the $100,000 scholarship package that supports a drive in the 2016 Battery Tender Mazda Global MX-5 Cup car. Joshua Allan began his career in motorsports securing a position as an engineer for Ferrari’s F1 team. He got his first taste of racing jumping into the Italian Formula Ford Championship eventually moving into a vehicle development role for Maserati. His immediate goal is to win the shootout and jump start his career in pro racing to attract sponsors and move up the Mazda ladder in the road to 24 Shootout. “The NASA racer development ladder is fundamental to building the skills of track fanatics and aspiring racers", said Joshua Allen. "Even with my experience, I chose to start in HPDE 1 and move up through each level because I knew that I would learn new concepts from experienced instructors and develop the knowledge and skills to share the track with etiquette while continuing to develop my driving skills. I subsequently became an instructor myself, which further informed and aided my development. After running Time Trials for a season I moved into racing in Performance Touring. Thanks to NASA's driver development system, I found myself racing with highly competitive and highly respectful drivers with strong awareness to race door-door while not giving an inch more ground than needed. That's the best kind of racing there is." At just 16 years old, Bruno Carneiro is the youngest finalist in the field. He's from Riverton, Utah where he started racing karts at the age of 4. After gaining 11 years of experience amassing multiple wins and championships, he decided to make the move up to racing cars. His choice; Formula Mazda. “The natural choice was to start racing with the NASA Utah Region at my home track Miller Motorsports Park," said Bruno Carneiro. "What impressed me the most is how welcomed I was by NASA Utah. I was fortunate enough to win the championship on my rookie year and that opened a whole lot of new opportunities for me." 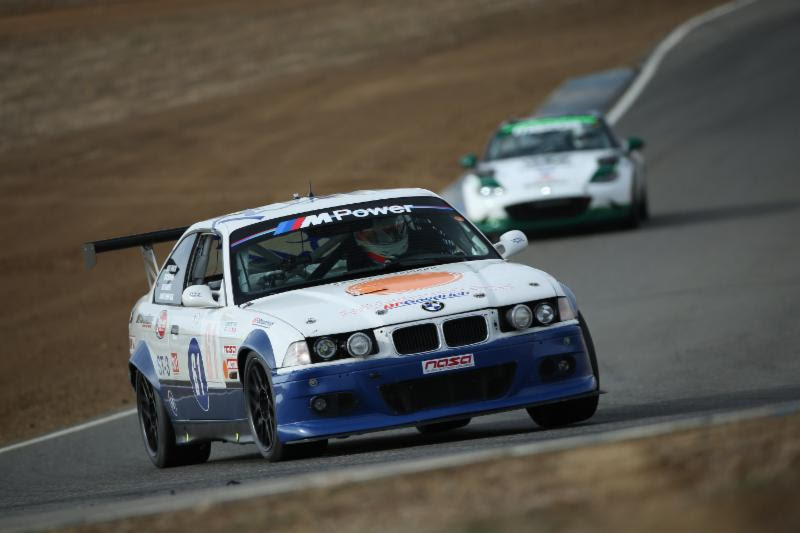 Mark Drennan, a native of Northern California got his start in racing cars with NASA in 2007 at Thunderhill Raceway. His current focus before next week's event is all about preparation and promotion. “Every step in my progression - from driving a computer simulator, to karts, and now to cars - allowed me to be immediately competitive at the next level and has been crucial to my development as a championship caliber driver,” said Mark Drennan. "I'm speaking with former shootout participants, series champions, driver coaches, and race engineers to gain their insights and advice. I'm also getting the word out to promote the Mazda Road to 24 program and my participation as a finalist." Mason Filippi began automobile racing with NASA in 2014. The most important thing to him this year was good consistent finishes. Mason had 4 wins and several podiums. Being only one week out from the Mazda Road to 24 Shootout, his current focus is studying the track, refining interview skills and promoting himself as well as Mazda through press releases. “NASA has a great field with talented and dedicated drivers. Mazda including the Teen Mazda Challenge champions in the Mazda Road to 24 shootout gave me the opportunity to compete for this amazing prize,” said Mason Filippi. Eric Powell began his racing career like many others honing his skills in karting before moving into stock car racing for several years. Later deciding there were more opportunities in Road Racing, he moved into NASA. “Currently I am 100% focused on winning the shootout and building my brand. NASA has been a great place to race for the past few years. Classes such as Performance Touring really allow someone with creativity and ingenuity like myself to shine,” said Eric Powell. The shootout will take place at Carolina Motorsports Park in Kershaw, SC, on November 8-10. The criteria for the shootout is to identify the aspiring professional racer who has the best range of skills required to succeed. These skills include speed, consistency, race craft, technical feedback and off-track business, marketing and PR skills. Napa Valley, CA - (November 2, 2015) NASA competitor Ryan Ellis, 25, will make his NASCAR Sprint Cup Series debut in the No. 33 for Circle Sport Racing on Nov. 15 at the Quicken Loans Race for Heroes 500 at Phoenix International Raceway. Ryan started his driving career racing quarter midgets at the young age of 4 eventually moving into INEX Legends cars. Now just 25 with over two decades of racing experience under his belt, he has arrived at the pinnacle of stock car racing. In 2006, Ryan entered the world of National Auto Sport Association (NASA) competition to begin the road racing portion of his career. He did exceptionally well winning a majority of the events he entered during the last 10 years of his NASA competition. In 2007 and into the 2008 season, Ryan campaigned a Mazda Spec Miata in NASA’s Mid Atlantic region. He finished 2nd in the inaugural Mazda Teen Challenge program, and was voted “Driver of the Year” by the NASA Mid Atlantic region. In 2009, Ryan moved to the West Coast and competed in the Southern California region of NASA, capturing the 2009 West Coast Teen Mazda Championship which secured an invitation to the finals of the Mazda Road to the 24 Shootout. Moving on, he continued to build on his racing resume showing well in various pro classes while also securing rookie of the year in the 2011 Continental Sports Car Series ST class. Ryan moved to NASCAR in 2012 amassing 49 combined starts in NASCAR’s Xfinity and Camping World Truck series’ with 21 of them in this the 2015 season. NAPA VALLEY, Calif. (Oct. 29, 2015) - The 2015 NASA 25 Hours of Thunderhill presented by Hawk Performance is receiving strong entries for all six classes. The 13th running of the now 25 hour classic will take the green flag December 5. 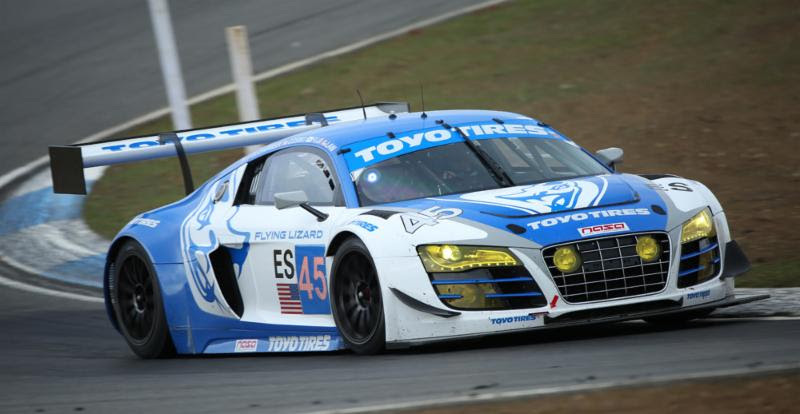 In the ES class, IMSA and World Challenge regulars Flying Lizards are bringing their Toyo tire shod Audi R8 LMS to Thunderhill. "We are basically running our Audi R8 from this past season, but it is in full GT3 trim, meaning all of the proper aero, ABS and traction control systems are in place," said Darren Law, team manager. "The main adjustments we have made are really in set-up changes to optimize the handling characteristics of the Audi with the Toyo tire. When asked about the competition Law said, "for sure we have to consider last year's winners from Davidson Racing. They have competed in this event several times and bring in some great drivers. There are several other good team and driver combinations, but honestly it is hard to say as the complete entry roster is not out yet so we are waiting to see. Our goal for this event is not only to win our class but we feel we can win overall. It is a unique race with multiple types of cars so it will be exciting." For the team used to running endurance races at Daytona and Sebring, the 25 poses some unique challenges. "Thunderhill is an interesting event, there will be far less 'pro' drivers here so you have to take a different mindset and be extremely cautious," he continued. "There are also different levels of cars and a very large differential of speed. Of course weather is always a factor and from what I have heard its cold, probably rainy and I have also been told there has even been snow in the past. I can honestly say I haven't raced in conditions like that before. We are still doing a lot of development work with Toyo, they have produced a great product, but we are entering this event without the time of a 24 hour race together so it is a great opportunity for both of us but as always there will be unknowns. It will be a great event and just like any of the other long endurance races, the key will be not only to have good pace but to stay out of trouble!" Another potent entry in the NASA Thunderhill presented by Hawk Performance was filed by Skullcandy Team Nissan. "We are going to run two 370Zs in the E0 class," said Lara Tallman, Skullcandy Team Nissan, team manager. "Last year we finished second in class with our BMW M3 and third in class with our Nissan 370Z, both ran in the E0 class. Before that the last time we ran was 2008 and we won our class with a Mustang. For Thunderhill, we do some small additions to the cars which include window defrosters, and additional lights. Finishing is always the primary goal, however, we are going for first and second in E0." "The 13th edition of the NASA 25 Hours of Thunderhill presented by Hawk Performance is drawing some great teams and drivers," Kunzman said. "The top class is always exciting, but some of the best racing happens in E1, E2 and E3. There are great teams up and down the entry list and I expect the field will be complete with 63 cars come December 5." Napa Valley, CA – (October 15, 2015) – National Auto Sport Association (NASA) drivers dominate the field of racers selected to compete in the Mazda Road to 24 Shootout. One talented club racer will be promoted to the professional ranks and receive the $100,000 dollar Mazda Scholarship package. 15 NASA Racers represent the majority of the total number of drivers selected for the Mazda Road to 24 Shootout (MRT24). The criteria for the shootout is to identify the aspiring professional racer who has the best range of skills required to succeed. These skills include speed, consistency, race craft, technical feedback and off-track business, marketing and PR skills. The Mazda Road to 24 Shootout is the single largest prize in grassroots motorsports. The $100,000 scholarship package supports a drive in the 2016 Battery Tender Mazda MX-5 Cup. For 2016, this will be in the all-new Global MX-5 Cup car, which officially went on sale on October 1.